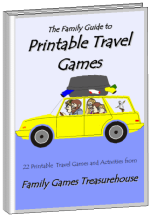 with free Easter hunt ideas and other Easter games for kids. What is one thing that your children look forward to at Easter time? Of course it's the annual hunt for easter eggs. As Easter slowly rolls around the excitement begins to mount as the children anticipate the arrival of the big day. Easter hunts have become a wonderful tradition in our family. It's something that our children eagerly look forward to each year as they usually get to go on two hunts - one indoor hunt and one outdoor hunt. The indoor hunt usually involves searching for clues, which lead to the next clue and so on until they finally arrive at the prize. When our children were very young they would follow the bunny feet throughout the house which eventually led them to the egg. As they got a little bit older they had certain picture clues which led them to the special treasure. Once the children could read well the clues became harder. 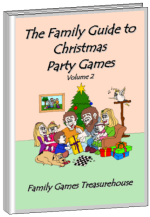 The oldest children have cryptic puzzles that they have to solve in order to claim their prize. Our outdoor hunts usually involve hiding lots of little eggs around the yard for the children to find. While the eggs are being hidden the children have to stay in the house with all the blinds and curtains drawn so that there is no chance of any peeking to see where the eggs are being placed. All in all, there is much pleasure, fun and excitement as each child adds another happy memory to carry with them throughout their lives. Are you looking for an idea that is a little bit different this year? There are many creative ways of planning an Easter egg hunt. The key is to begin your planning in advance - which is why you've come to our website! Here at Family Games Treasurehouse we have a terrific assortment of free Easter Egg Hunts suitable for both indoors and outdoors. Plus we have a page full of clues for younger and older children for you to use as well. 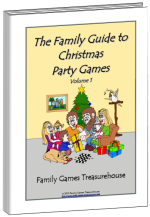 Click on the highlighted game of your choice below and you will be taken to a page with full instructions on how to play the game. 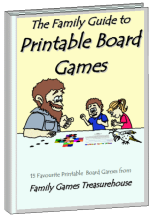 Most of these games can be played, or adapted to, indoors or outdoors. Easter Egg Hunting Game - how many eggs can you find in a minute? Easter Treasure Hunt - an adventurous journey of cryptic clues will lead to the treasure! Easter Crazy Golf - you'll need to putt your way through the obstacles to get to the egg! Decipher the Code - crack the secret code before you crack the egg! We hope that our Easter egg hunts gave you some creative ideas for your own hunt this Easter. 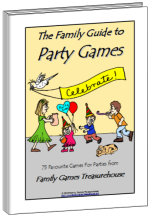 We have many games for all kinds of occasions on our website. We hope you'll stay awhile and look around.